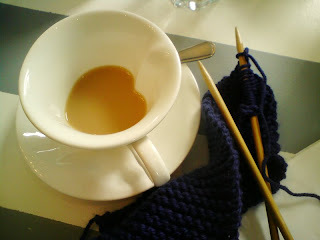 My housemate (Leila) and I went for a tea and a knit at the Queen of Tarts this afternoon. I had a cupcake and a pot of tea. The tea cups were in the shape of hearts! I haven't really knitted since we moved house and it's so nice to start something up again, whilst I'm at my computer, I slowly pan my eyes over to wear my knitting lies on my desk. I'll be blogging about all of that soon.